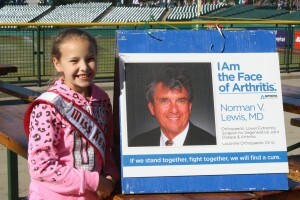 Hannah Martin, Kentucky Jr. Pre-Teen Queen, participated in the Arthritis Walk. 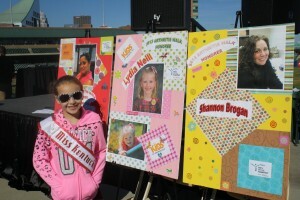 Hannah Martin, Kentucky Jr. Pre-Teen Queen, participated in the Arthritis Walk. The event was help in Louisville, KY at the Louisville Slugger Field. This event was used to raise money to support Arthritis research. The non-competitive 5K walk (3.1 miles), with a one-mile option, is expected to raise $62,000 to support local Arthritis Foundation programs, services and research that hopefully will lead to a cure. More than one million people of all ages in Kentucky have been diagnosed with arthritis, that’s 32 percent of the state’s adults. Kentucky ranks second in the country for the highest incidence of arthritis in adults. And nearly 4,000 children in the state have been diagnosed with arthritis. Fibromyalgia affects about five million Americans and is a condition associated with widespread chronic pain, fatigue, memory problems and mood changes. Rheumatoid arthritis, a systemic autoimmune disease, affects 1.5 million Americans. Women are two to three times more likely to get RA than men. RA can affect more than joints. The heart, lungs, eyes, blood vessels, nervous system and more can be involved. Juvenile arthritis affects nearly 300,000 children, more than the number of children affected with juvenile diabetes and cystic fibrosis combined. 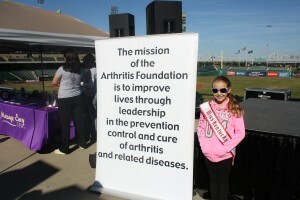 The Arthritis Foundation (www.arthritis.org) is committed to raising awareness and reducing the unacceptable impact of arthritis, which strikes one in every five adults and 300,000 children, and is the nation’s leading cause of disability. To conquer this painful, debilitating disease, we support education, research, advocacy and other vital programs and services. Previous Previous post: Miss Georgia Queens help at the Ronald McDonald House. Next Next post: A few days after Alexandria Murphy was crowned, Miss North Carolina Jr. Teen Queen, she was very blessed to have traveled through the Mediterranean.